"Right now, with the current administration, with the current circumstances, with the abdication of responsibility that we've seen from so many powerful people, even people who abdicate that responsibility by calling themselves liberal or a Democrat, or whatever it is, I feel a need for all of us to breathe fire," Ocasio-Cortez said. In October, Ocasio-Cortez said defeating global warming required using the blueprint used to defeat the Nazis. "When we talk about existential threats, the last time we had a really major existential threat in this country was around World War II, so we've been here before, and we have a blueprint of doing this before. 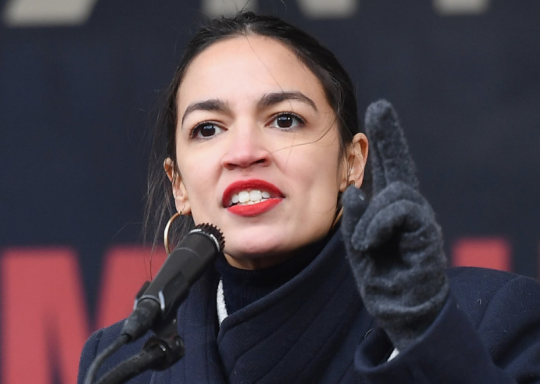 None of these things are new ideas, but we have is an existential threat in the context of war," Ocasio-Cortez said at a climate change town hall. The New York Democrat has pushed for a "Green New Deal," arguing that "Americans are dying because of a government too coward to save the planet." The initiative calls for the United States to transition from fossil fuels to 100 percent renewable energy within 10 years. She has also urged elected officials to reject money from fossil fuel corporations. This entry was posted in Politics and tagged Alexandria Ocasio-Cortez, Climate Change. Bookmark the permalink.